One of energy efficiency’s many benefits is that it reduces greenhouse gas (GHG) pollution by decreasing the amount of electricity that utility companies must generate to meet customer demand. So, let’s look at just how big a role efficiency can play in cutting climate change pollution. 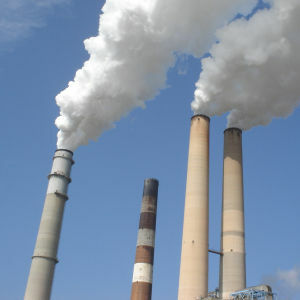 In its recently released data on energy-related GHG emissions, the U.S. Energy Information Administration (EIA) showed a continued decline in nationwide GHG emissions from electricity generation. Nationally, EIA found that the biggest reason U.S. GHG pollution dropped between 2005 and 2017 was because demand for electricity declined, despite the country’s continued economic growth in recent years. 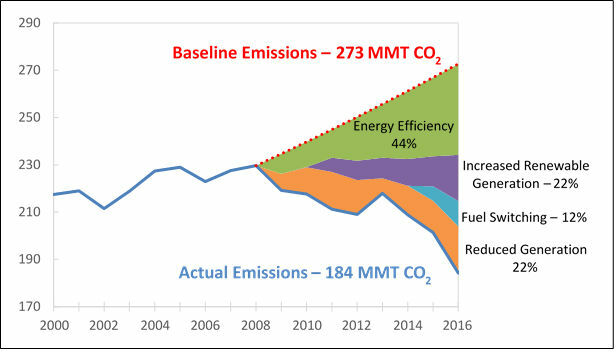 And, the EIA said, shrunken demand for electricity accounts for over half of the GHG emissions reduction from a business-as-usual (BAU) projection. Two other factors, power plants switching from coal to less emissions-intensive fossil fuels and the addition of new, renewable energy generation, trailed efficiency as reasons the electricity sector emitted fewer GHGs across the United States. SWEEP analyzed if similar trends and drivers also occurred in the six states where we work by using EIA’s state-by-state GHG emissions and electricity generation data. Consistent with national trends, electricity sector GHG emissions in the six SWEEP states fell 20 percent between 2008 and 2016, from 230 million metric tons (MMT) of CO2 to 184 MMT. The drivers behind this decrease are similar to those nationally: decreased electricity usage as a result of energy efficiency improvements, increased penetration of renewable energy, and switching from coal and petroleum to natural gas generation. In addition, all states in the Southwest except Colorado generate more electricity than is needed to meet in-state demand, exporting the excess consumption to neighboring states. The level of electricity exported outside the region has declined over the past decade. Thus, an additional driver of GHG reductions in the Southwest has been decreased overall electricity generation. The balance of these four drivers in reducing GHG emissions varies state-to-state. In the southwest region, reduced electricity demand (i.e., increased energy efficiency) contributed to a reduction in GHG emissions in all states. Increased energy efficiency includes the benefits of utility-sponsored demand-side management (DSM) programs, improved codes and standards, and other actions that are increasing the efficiency of energy use and cutting energy waste. It also includes behind-the-meter renewable energy production. As the chart above shows, energy efficiency accounted for 44 percent of the GHG emissions reduction in the region during 2008-16. Colorado and Arizona, the two states in the region that have historically invested the most in utility-sponsored DSM programs and thus achieved the highest levels of sustained electricity savings, saw the greatest reductions in GHG emissions from reduced demand, both in absolute emissions reductions and in the percentage of electric sector GHG emissions reductions attributable to declining electricity demand. Similar to national trends, approximately half of the emissions reductions in each state were attributable to lower electricity demand. Colorado and Arizona are also the two states in the region that have the highest rankings in ACEEE’s State Energy Efficiency Scorecard. In Nevada and Utah, approximately 30 percent of the GHG reductions in the electricity sector can be attributed to reduced demand, the second largest factor in each state. Nevada and Utah have made significant investments in utility DSM programs, although the savings achieved fluctuated significantly over the past 10 years and have not historically been at the same level as the region’s leading states. Nevada and Utah have intermediate rankings in the ACEEE scorecard. Finally, New Mexico and Wyoming saw less of a reduction in GHG emissions from energy efficiency, as compared to other factors. Both these states, though, have more limited investments in utility DSM programs and have lower rankings in the ACEEE scorecard. Behind energy efficiency, increased generation from utility-scale renewable resources and reduced generation also contributed to reduced emissions, with each factor responsible for 22 percent of the reduction region-wide. Renewable generation is a large contributor to reducing emissions in all states, especially Colorado and Nevada. This trend is expected to continue because utilities around the Southwest continue to invest in renewable resources, given the region’s low-cost but high-quality solar and wind resources. Finally, fuel switching played a smaller role in reduced GHG emissions in the Southwest compared to the nation as a whole. The electricity sector has seen a significant reduction in GHG emissions over the past decade. This analysis confirms that energy efficiency investments, stimulated in part by state policy initiatives, were by far the largest contributor to this decline in the Southwest between 2008 and 2016. The GHG emissions reductions from increased energy efficiency are most pronounced in the Southwest states that have made stable and long-standing investments in energy efficiency resources, demonstrating that policies do matter. Justin Brant is a Senior Associate in SWEEP’s Utility Program, where he works with utilities and consumer groups to advance energy efficiency in SWEEP’s six-state region.